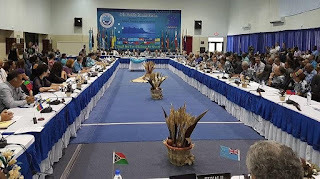 The Vanuatu Association of Non-Governmental Organisation (VANGO) has expressed its firm solidarity with the Pacific Association of Non-Governmental Organisation (PIANGO) on West Papua. The VANGO support was expressed by the Chairperson of the Vanuatu national NGO group Ms Lind Peter in an email to PIANGO Executive Director Ms Emele Duituturaga, who is currently in Pohnpei, FSM, where they have held the Civil Society Organisations (CSO) Forum on the eve of the 47th Pacific Islands Forum leaders meeting. In her media briefing earlier in the week, Ms Duituturaga made PIANGO’s stand on West Papua clear – that the issue was no long a matter for the Melanesian Spearhead Group nor the PIF leaders; but rather a United Nations issue. VANGO’s Linda Peter says in her email and quoted by Vanuatu reporter covering the Pohnpei PIF meeting Moses Stevens. “We Vanuatu Civil Society Alliance is in solidarity with other local CSOs here in Vanuatu and will continue to advocate locally, nationally and regionally for the freedom for West Papua in alliance with PIANGO and the global community. The Vanuatu government is also taking a similar stand in their approach to lobbying support for the independence cause of West Papua. Director General of the Prime Minister’s Office (Vanuatu) Johnson Naviti, says “now that more regional governments have stood out clear on their support for West Papua, our plans now is to take the mater beyond the region”. While leaders of the Melanesian Spearhead Group (which was formed initially to spearhead the independence cause of West Papua and Kanaky) have divided over West Papua, Solomon Islands has taken a clear stand with the support of Tuvalu and Nauru in their “Pacific Coalition for West Papua”.